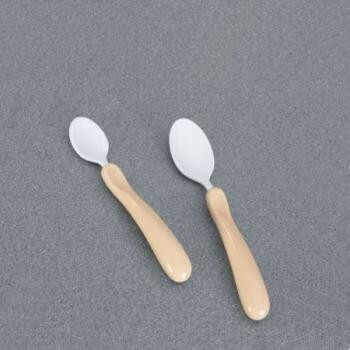 These soft coated spoons have been dipped in soft, food quality PVC. They may be beneficial for users with bite reflex problems or a sensitive mouth. Coated Caring Cutlery...These soft coated spoons have been dipped in soft, food quality PVC. They may be beneficial for users with bite reflex problems or a sensitive mouth. Due to the type of use to which these items are subjected, they are only guaranteed for three months. The spoons are hygienically sealed into the contoured Caring Cutlery handles, are easy to clean and dishwasher safe. Length of handles 127mm (5").